Investment partners from Modesto are offering to sell this luxury home in Cutten for $120,000 more than they paid at auction. The elevated walkway into Humboldt County’s Courthouse seems suspended in air, one flight of stairs above the homeless, the occupiers and the rumble of Fifth Street traffic. This pale patch of concrete is where hopes disintegrate and homes are lost. Almost every weekday morning, as precisely as if they were figures from a mechanical clock, a man or a woman or both emerge into the wind, the rain or the wan winter sunshine. They hold clipboards or slim binders. They read from a script, with just the slightest variations. If no one listens, they read to the empty air. Three times, and it’s done. If no one bids, the house reverts back to the lender. Another home is foreclosed. Sometimes there’s a buyer or two, and the auction takes a few moments longer. 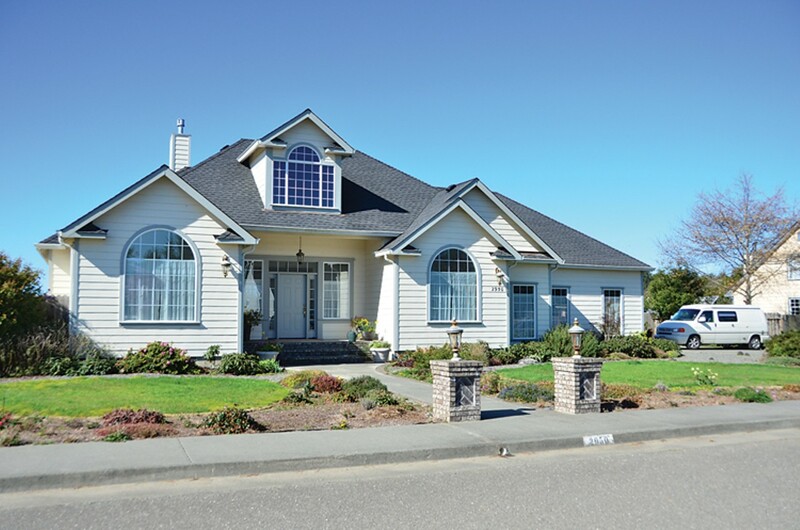 Once the lender’s minimum is surpassed, the highest bidder wins a freshly foreclosed lien. Either way, under California law, these public sales must be held before a bank can take back someone’s home or land. These rote recitations of the auctioneers can be the final sound of a property vanishing from one set of hands and landing solidly in another’s. The man isn’t buying. He hasn’t brought the essential ingredient: A cashier’s check for the full amount he’s willing to bid. 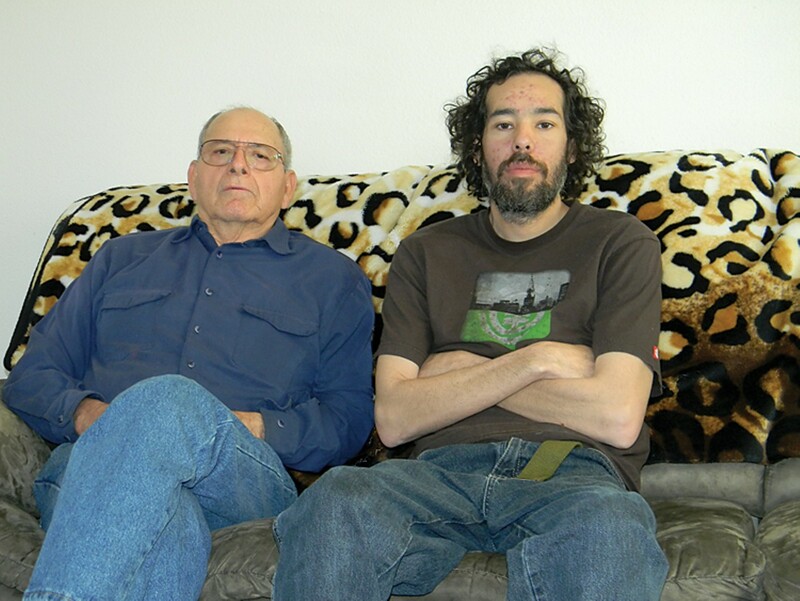 Two serious would-be buyers wait, their checks at ready. 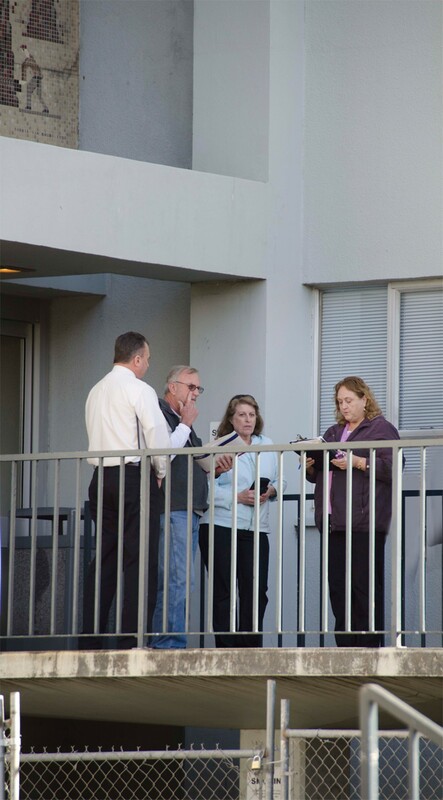 One is a blonde woman in dark blue jeans and a gray jacket, who also declines to give her name. She says she’s a real estate agent, there on behalf of an investor. The other is David Dickinson, the owner of Emerald Coast Homes, Inc. Lean and bearded, Dickinson wears working clothes but carries a big wallet. He’s been buying and selling foreclosed homes for years. 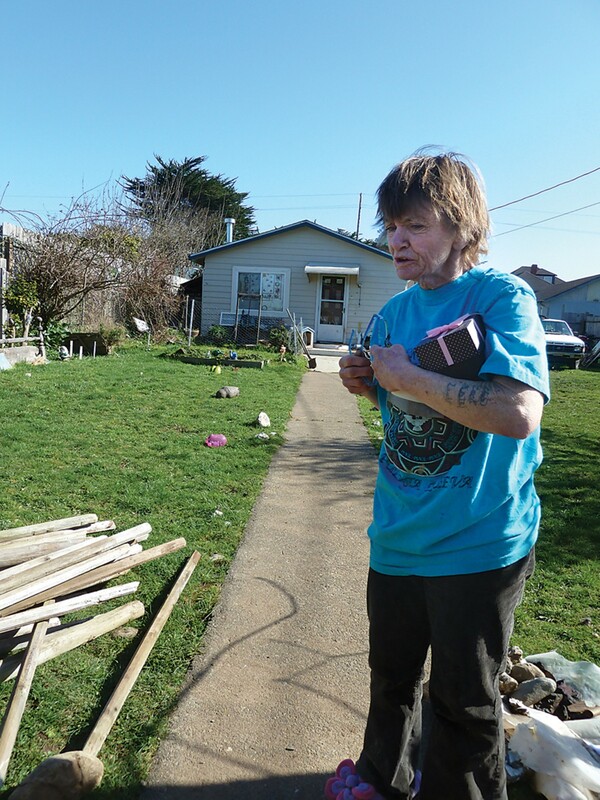 He and his rival both have their eye on a well-kept little duplex in McKinleyville. So far, it’s still owned by Alma and Jose Magaña, but their mortgage has gone long unpaid. Dickinson knows the property better than some auction buyers do. He walked up to the family’s door not long before auction day, and introduced himself as the man who would be buying their home. “He had a schedule in his hands and said this house is on my schedule, and I’m going to buy it,” Jose Magaña recalled later. Magaña is 70, and his brown eyes are steady behind his oversized glasses. His grandson plops on the couch as he talks, snuggles briefly, and then toddles off again. The family is in between auction dates — one postponed, another scheduled — and they waver between hope and resignation. Jose Magaña speaks more English than his wife Alma, but if the conversation veers far from the basics, their son Joe Magaña translates. His parents are in Humboldt because of Joe. The elder Magañas spent most of their lives in the Imperial Valley. When he was just 19, Jose started at the bottom, tending cattle at a feed yard in Brawley. By the time he left 30 years later, he was the foreman. Jose and Alma became entrepreneurs then, running a sandwich shop, a drinking water service, a take-and-bake pizza business. Their two daughters were settled nearby, but their only son, Joe, lived in Humboldt. Joe worked in restaurants, too, then went out on his own, with a taco truck he called Que Grande. “It was really good at the beginning, the first three or four years,” Joe said. Customers loved the chicken tinga burritos. Mom and dad moved north to cook for him, in a commercial kitchen space they rented by the hour. 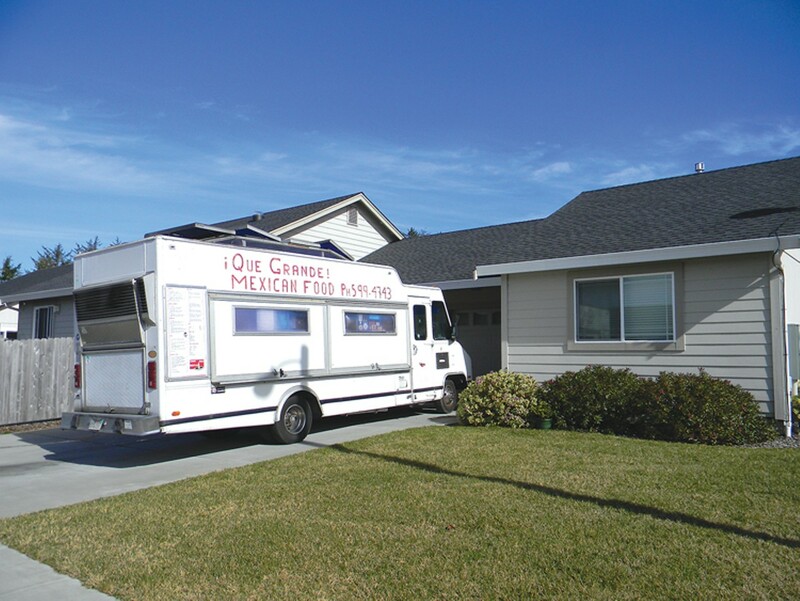 In 2007, Jose took $40,000 saved from a lifetime’s work, and put 10 percent down on a brand new duplex at 1417 Gardenbrook St. Joe moved into the smaller unit, with one bedroom and its own one-car garage. His parents settled in the compact main house, with three bedrooms and two baths. For a while, everything around the Magañas had seemed to flourish. Joe opened a second Que Grande truck. He met Lauren Pollock, and they had a son. The younger family — now five including Lauren’s two older children — moved into the bigger side of the duplex, and the elder Magañas took the one-bedroom side. But their mortgage was big, $2,600 a month including taxes and insurance, and Alma hoped they could lower it by working with a loan modification company she’d heard about from a friend. Since then, her son said, she has worked with at least three operations that offered to help reduce the mortgage, including one that took a payment and vanished, and another that collected $500 upfront, then demanded $250 each month and instructed them not to speak to their lender. The companies are a source of family strain. They deal with Alma in Spanish, and one scolded her after her son tried to intervene. When the family spoke with the Journal, Lauren turned to Joe at one point, her voice edged with despair, and said “a fraudulent company has been telling us not to call the bank.” But, countered Jose in Spanish that Joe paraphrased, so far, we still have the house. One auction was postponed. That company must be helping. The company the Magañas say they are using now doesn’t have a real estate broker’s license, according to the California Department of Real Estate. Generally, only licensed real estate brokers or attorneys are allowed to renegotiate loans on anyone’s behalf, said department spokesman Tom Pool. On top of that, it’s illegal in California to collect any payment in advance to modify a mortgage, he said. Payment can only be demanded after a loan is successfully modified, said Pool. The Magañas didn’t know that when they started paying. And increasingly, the family has had other distractions. Jose’s heart problems kept him away from work for months, cutting profits when the taco fleet had to drop from two trucks to one. And Joe, only 36, has had to leave work to see specialists in Oregon and San Francisco, trying to combat symptoms that leave him with a jerky walk and overwhelming headaches. In November, fans of Que Grande held a benefit at the Bayside Grange to fund some of these trips. Joe and Lauren had been delaying the next one, to Los Angeles, because they didn’t know if they’d have a home to come back to. They packed a few things, and took others to a thrift store. That’s when David Dickinson came to their door. He didn’t stay long, just chatted on the doorstep for about 15 minutes, Jose said. He told them they would have 30 days after the sale to get out. The Magañas still don’t know if he will one day own their house. Waiting for each foreclosure auction to begin is like watching a play. The characters strut up or edge in timidly, with cashier’s checks or with questions, with economic theories or with quiet confessions. The Journal is doing an article on the auctions? Oh no, says one man, more competition. These houses, some of them are just trashed by drug dealers, says one woman. Making the bid, putting that much cash on the line, is an incredible rush, confides a guy who’s bought a few. We’re here about a sister’s house, one worried couple tells an auctioneer. A stocky woman comes to see if her own place is going to sell. A young couple watches the house they are renting change hands. People with enough nerve and enough cash grab the bargains. 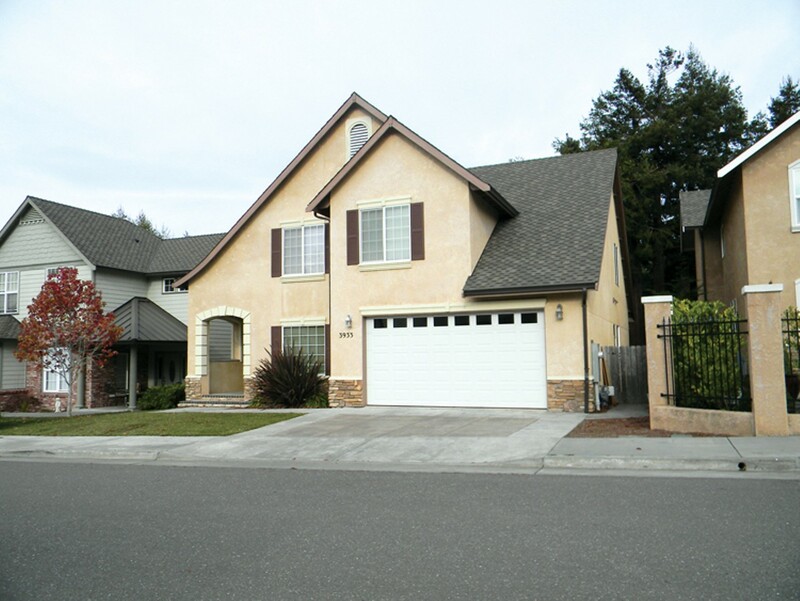 In January, two men who built a real estate empire in Modesto snapped up a vacant luxury home in a gated subdivision in Cutten for $308,001. They swiftly put it on the market for $429,000. Dickinson, teaming up with a man he called an old buddy, picked up a little house on Pine Street in Eureka for $45,501, just one dollar over the lender’s minimum bid. That one will be messier — a frail woman, rambling and disbelieving, was living there the day they bought it — but the low price left plenty of room for profit. And here’s the heartbreaking thing — often, lenders are now selling these properties for far less than what’s owed. Some houses go for so little that if the people in them could just get a loan, the payments would be easy. A $45,501 mortgage, at 4 percent, would cost just $217 a month — less than rent, and far less than the former owner was paying on a $200,000 loan. In early February, Bank of America was ready to start the bidding on the Magañas’ duplex at $224,700, even though the family owes close to $340,000. If some guardian angel with good credit could sweep in and help the Magañas get a 4 percent loan for $224,700, the monthly mortgage would be $1,073. Even if taxes and insurance added another $300 or $400 a month, that’s much less than the family is paying now. They could afford it. Little wonder that the few foreclosed homeowners willing to speak with the Journal weren’t terribly angry with the people buying their houses at auction. They were furious with their lenders. Or with the regulators, real estate agents and mortgage brokers who encouraged them to get so overextended. Or with themselves. Bank of America, which became the nation’s biggest loan servicer after it bought Countrywide Financial in 2008, won’t talk about the factors it considers when it sets a minimum bid for foreclosure actions. State law says the starting bid can’t be higher than the amount owed. Sean O’Toole, who founded a website and tracking service called ForeclosureRadar.com, said that often — but not always — lenders set minimum bids at market price minus their costs, which can include evicting whoever is in the house, fixing the place up and paying an agent to sell it. Other times, though, the starting bids seem inexplicable, tangled in bureaucracy or in old agreements made with investors who bought mortgage-backed securities before housing imploded. In Humboldt, as in much of California, most “auctioned” houses attract no bidders at all, and become property of the lender. The handful of successful bidders must be patient. Auctions are postponed again and again as homeowners scramble to salvage what they can. Some homes linger in foreclosure limbo for a year. In January and February, when the Journal attended dozens of auctions, there were just two auctioneers: The tall man in the camoflage hat who regulars call Ron, and a round, cheerful woman who people call Marian or Maryanne, with cascading curls and a kindly, lined face. They are contractors, juggling phone calls and noting last-minute bid amounts or postponements from the firms that hire them. They won’t talk for the record about their jobs. Pat Grace, who is now chief title officer for Fidelity National Title in Eureka, knows and sympathizes with both of them. Grace used to conduct auctions himself, for a company affiliated with Fidelity, in his office lobby in Eureka. That stopped after a homeowner’s threat, Grace said, and he doesn’t miss the work. At least one title company here still holds a few auctions, but in Humboldt County today, almost all are held just outside the courthouse, at 825 Fifth St. in Eureka, starting at 10, 10:30 or 11 a.m. Go to even a few, and it doesn’t take long to see peculiar things. For example, when two potential rivals agree to bid together instead of against each other, is that a legitimate business partnership or an agreement to artificially depress the sale price? (Elsewhere in California, the Justice Department has charged some auction buyers with colluding to restrain competition by agreeing not to bid against each other.) When Dickinson tells the renters in a house he just bought that their lease is void, is that deliberate tactic, or is he just unaware of the 2009 federal law that says foreclosure buyers generally must honor valid leases? Asked directly one day if simply he didn’t know about the law protecting renters, Dickinson initially declined to comment. He spat out one word, “Presstitute!” and turned away. A couple of weeks later, he warmed a bit. “I may have been mistaken” about that law, he said. It wasn’t relevant anyway, Dickinson said, because he gave the renters some cash and they moved out. Out in the open air, near the spot where Ron and Marian read their scripts, the morning sun casts long shadows, bars of darkness from the metal railings that line the passageway. A sign warns, “No camping, lodging, sleeping or laying.” The sign went up in January to fend off the Occupy protesters, a crowd so motley that it’s unclear whether the sign maker confused “lay” with “lie,” or truly felt the need to prohibit fornication. At auction time, this spare island of elevated concrete is also where hopes are born and homes are found. And sometimes, auction buyers aren’t landlords or investors or home flippers. Some are just house hunters looking at every option they can find. Standing close together on a February morning, Victor and Linda Stratman show their check to Marian, the friendlier of the two auctioneers. They married recently, a late marriage of gray hair and a lifetime’s assets. They have managed to come up with more than $300,000 to enter the competition for a cream-colored house in McKinleyville, one with daffodils and lobelia blooming along a stately entryway, not far from oceanfront homes beside the Hammond Trial. The couple began attending auctions last year. 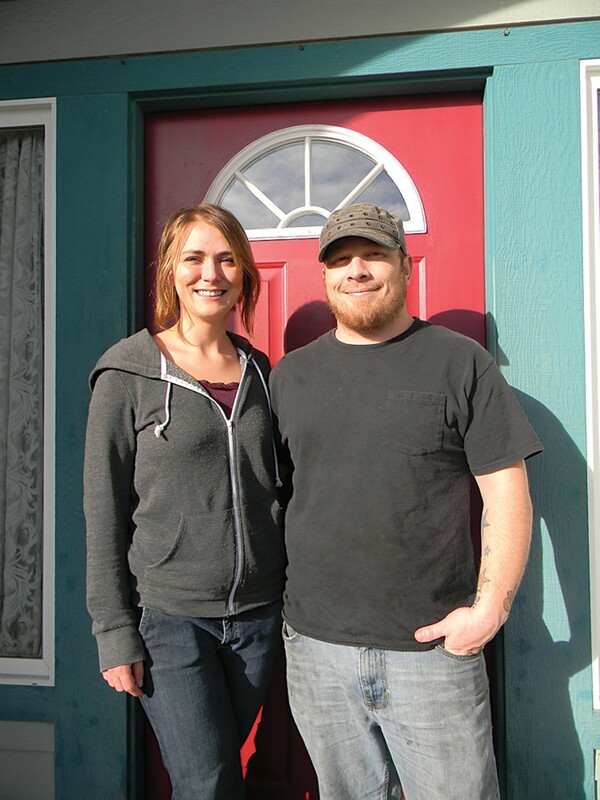 The Stratmans have been looking for months for a one-story home, and only McKinleyville will do. They’ve watched postponement after postponement. One house they liked was delayed for five months. Now they’re hoping for another. They’ve seen the home at 2950 Springer Ave. before, according to Ruth Hooper, who lives there. Their agent brought them through when Hooper was still trying to placate her bank by doing a short sale. Hooper bought the house back in 2007, after she wearied of Southern California’s traffic, wound down a career managing a dental office, and decided to settle in Humboldt. “The realtor showed me this house first and I said, ‘No, no, no that’s not anything I wanted.’ I wanted a little small house, a cottage. She took me around and showed me different areas. Then she came back to this.” Hooper’s agent hooked her up with a mortgage broker, who told her that if she put $100,000-plus down from her retirement savings, she could qualify for a $417,000 mortgage — even though Hooper only got around $1,200 a month from Social Security. She could pay the $2,389 monthly mortgage out of retirement savings at first, the broker told her. And later, she could refinance. But when Hooper tried to refinance, the market had changed. The broker couldn’t help her. “I know it’s not all their fault, because I could have said no, but I was kind of misled a lot,” Hooper said. 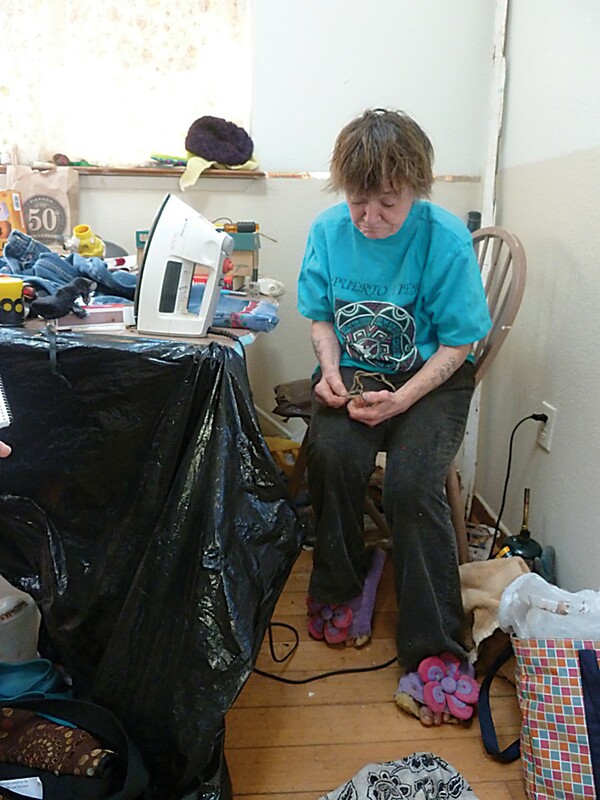 She began working as a caregiver to keep up on mortgage payments. She looked for roommates. Her savings were going fast. Going once. Going twice. No one else said anything. No one even looked interested, except the auctioneer, a real estate agent who seemed to know the Stratmans, and a reporter. “It has now been sold. It’s yours. You can’t change now,” Marian said, and smiled. The Stratmans kissed. Last week, Hooper was packing boxes. 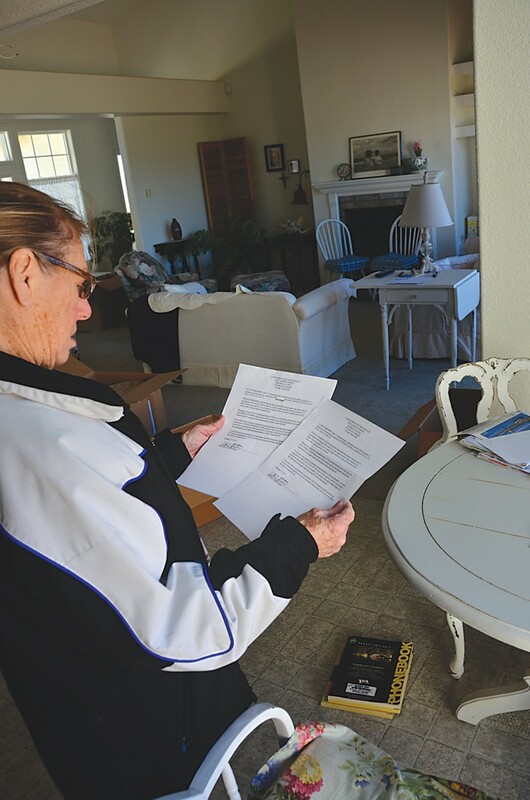 The Stratmans had mailed her an eviction notice and tacked another on her door. She had hoped they would give her a little time to get organized and move, and maybe help with that “cash for keys” she’s heard people talk about. She had hoped they would be patient with her. She even hoped they knew they were lucky to have that much cash. The Stratmans, after initially giving the Journal a brief interview, didn’t want to talk about their new home any more. Around the country, it’s not particularly common for people like the Stratmans, ordinary house hunters who want a place for themselves, to buy at auctions, said O’Toole of ForeclosureRadar.com. The pitfalls are enormous. Along with cash, a buyer needs knowledge — is the loan that’s gone bad a first mortgage or a potentially worthless second? What taxes or other debts might still have to be paid? What kind of shape is the house in? How hard will it be to evict the occupant? “It’s a very, very risky place to buy real estate,” said John Myrtakis, who along with Ken Elving is one of two managing brokers at Matel Realtors in Modesto. Myrtakis and Elving have been active in Central Valley since the late 1970s, and in 1985 they formed a partnership, Jamke, whose name comes from their initials. Jamke has purchased hundreds and hundreds of foreclosed homes, in California, Arizona, and Nevada. It sells most of the distant ones, and keeps a huge portfolio of rental properties in and around Modesto. Elving and Myrtakis also own an abalone farm in Davenport, in Santa Cruz County, and each has additional partnerships that own more property. Their holdings are vast. Of course, anyone doing it would be competing with Myrtakis. Which might or might not affect his advice. 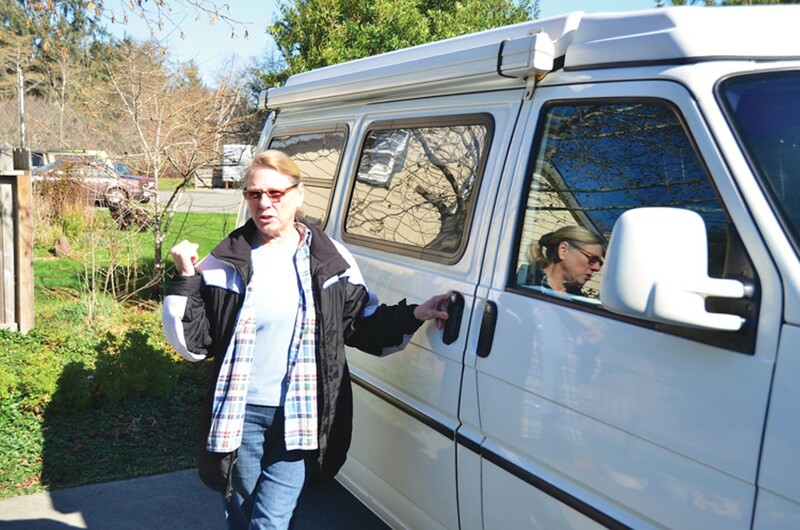 Jamke came to Humboldt for the first time this year, sending a local real estate agent to bid at several auctions. She declined to give her name or say who she was representing, but there she was, a slim brunette, offering $184,500 cash for a newer home in McKinleyville, $273,601 for a large but slightly bedraggled-looking home with a pretty marsh view on Old Arcata Road, and $308,001 for that luxury home in Cutten. She lost the McKinleyville one to David Dickinson, but won the other two. Just like that, Jamke had put almost $600,000 cash into two houses in higher-end neighborhoods hundreds of miles from its home base. “Why not?” said Myrtakis. “We buy properties all over California. We thought we’d dip our toes in Humboldt and see how it turns out for us.” So far, it’s going well. 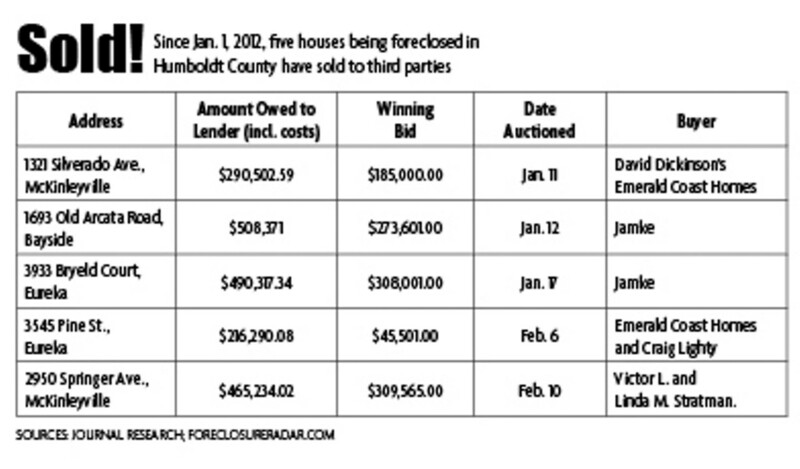 Jamke was the only bidder on 3933 Bryeld Court in Eureka on Jan. 17. The house was already empty, a notice hanging from the door about how to turn the water back on. Neighbors say the couple who lived there left for a job transfer. County records showed the unpaid debt on their home was $490,317. It didn’t need much work. A little fresh paint, and now it’s up for sale, at $429,000 — $120,000 more than Jamke paid at auction. The sale listing touts granite counters, stainless steel appliances and cathedral ceilings. David Dickinson strides into the county courthouse as if he owns it — and if it were going for a good enough price, he’d probably bid. He reeks self-assurance. One morning, outside the courthouse, he grinned and slipped a pocket knife into an auctioneer’s pocket, so that he could race inside and get past the security checkpoint to swiftly check some documents. 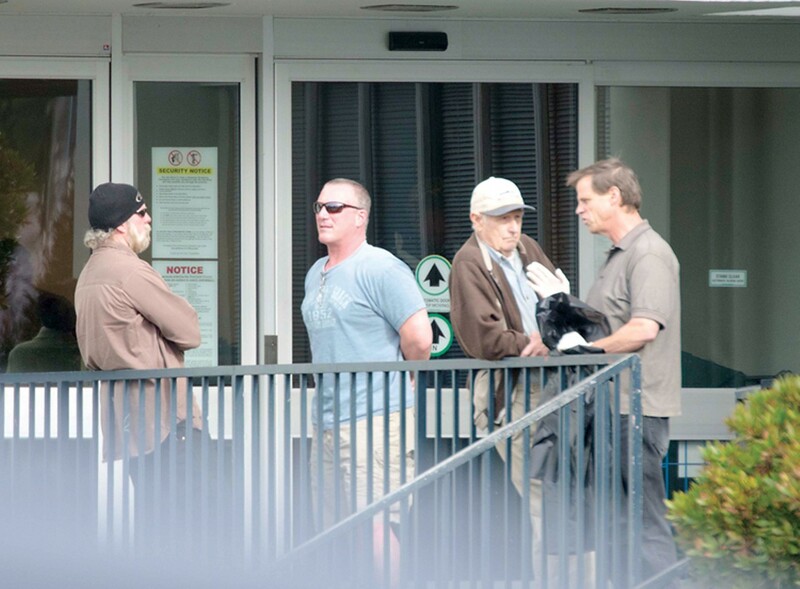 At winter auctions, Dickinson favors jeans, work boots, a black knit cap and sometimes dark glasses. 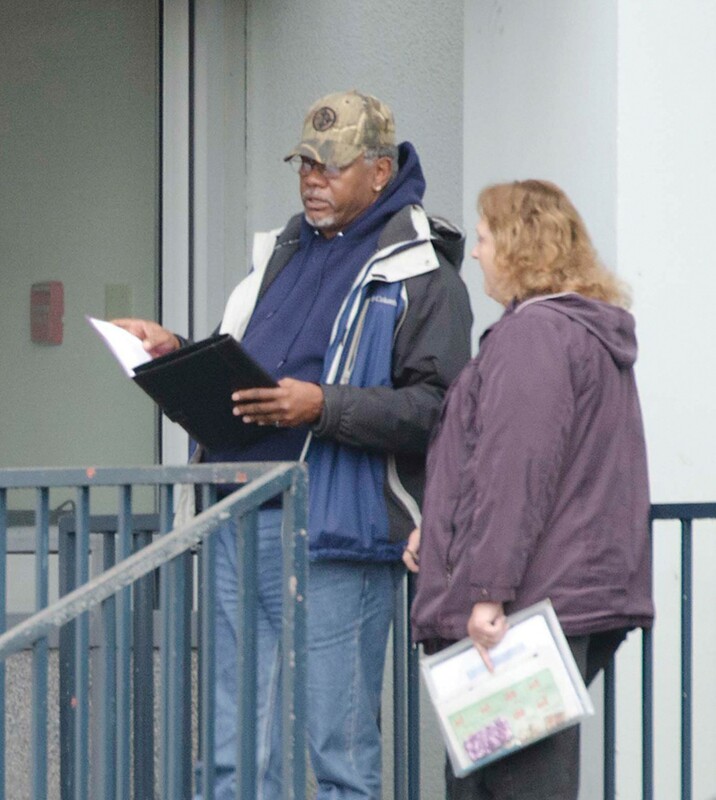 Kacey Chunn and Holly Riedel first met him on Jan. 11, when the house they were leasing at 1321 Silverado Ave. in McKinleyville went up for auction. They had come home three days before Christmas to find a three-page notice, full of legal-speak, posted on the red front door of their tidy green home. The young couple from Michigan attended the sale to see what was going to happen next. The auctioneer started the bidding at $182,727.06, and Dickinson went 94 cents higher — $182,728. A dark-haired woman, the same one who later bid for Jamke, made it $183,000. The auctioneer called her Suzy. His tenants walked up hesitantly and introduced themselves. “We have a lease,” Chunn told Dickinson. “The lease is void,” Dickinson told them. “You have a lease with someone who doesn’t own the property.” He told them he isn’t in the landlord business. He said they can offer to buy the house, or they can take some cash in exchange for giving him the keys, or he’ll call in an attorney. “It’s a screwed up situation,” he said to them. Chunn is a cabinet installer and Reidel is an artist. Initially, they were alarmed by Dickinson, who pulled them aside soon after the sale and arranged to walk through the house. “He kind of came across as a big scary biker kind of guy,” said Chunn. “So I had some friends come over.” It turns out Dickinson just chatted with the friends about motorcycles and talked about his work. The couple would get $3,000 if they left within a month, and less if they took longer. That would, at least, replace the $2,750 security deposit they’d given the last owner. They suspected they might have had rights to something more, but they didn’t want to make trouble for anyone, Chunn said later. They moved. Dickinson doesn’t like to talk much about his work. After that Jan. 11 sale, he told the Journal, “this is all I do,” buying and then reselling properties under the name of Emerald Coast Homes. He throws lots of work to a contractor who helps him get foreclosed homes ready to sell. Emerald Coast Homes incorporated in 2003, and has since bought at least 15 homes at foreclosure auctions, including a flurry in 2009. Most recently, in early February, the company sold a home on Starlund Court in Cutten for $235,000 just four months after buying it at auction for $180,101. Under his own name, Dickinson owns property in Kneeland, where his business is based. Besides lacking familiarity with the 2009 federal law protecting most renters in foreclosed homes, Dickinson may have other issues. His spontaneous agreement to join forces with a potential competitor on another property could run afoul of the protections for lenders who sell homes at auction. Elsewhere in California, the federal Department of Justice has gone after schemes that artificially hold down prices at foreclosure auctions, charging some investors with bid rigging. It’s a complicated area of the law, but the concern is basically this: competitors who agree not to compete artificially hold down prices, and so get better deals than the free market would provide. It can be easy for buyers who see each other regularly at foreclosure auctions to stumble into what regulators might consider collusion, without realizing they’re doing anything illegal, according to Jon Goodman, a Colorado attorney who specializes in real estate law and has looked at bid-rigging cases. For his part, Dickinson said, bidders team up “many, many times,” for many reasons, such as pooling resources. Bank of America, the foreclosing lender on this house, declined to comment. Now Dickinson has his sights on the Magaña duplex, home to seven people spanning three generations. So far its auction has been postponed at least twice. Alma Magaña, overwhelmed with her son’s illness and the constant uncertainty, sometimes is too stressed to deal with one more round of paperwork, one more set of questions. In early February, within hours after the Journal called Bank of America asking about the loan, the family heard directly from the bank. A Spanish-speaking bank representative phoned, asked some questions and answered others. Soon, the family was told, the next auction would be pushed back further, until March 2 — enough time for Joe to see doctors in Los Angeles. Not long after that, the bank offered the Magañas a trial loan modification. Even Dickinson says he is rooting for them. If they can pay a smaller mortgage for the next three months, and if their finances don’t change, their first mortgage will be permanently modified. If they miss those payments, they’ll be right back on track for a foreclosure auction. The first modified payment is due March 1. 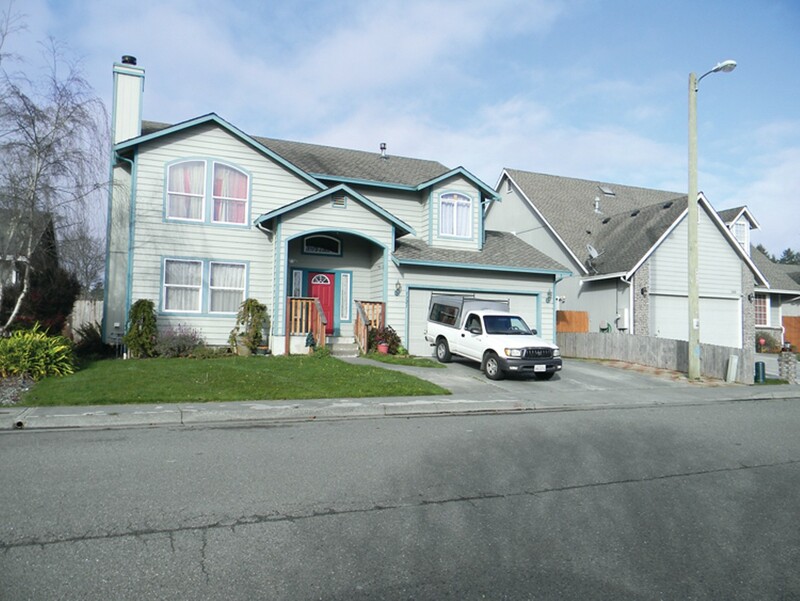 The duplex is scheduled for auction March 2. That auction will be postponed if the Magañas pay on time, said Bank of America spokeswoman Jumana Bauwens. If not, Dickinson or others like him will be waiting. 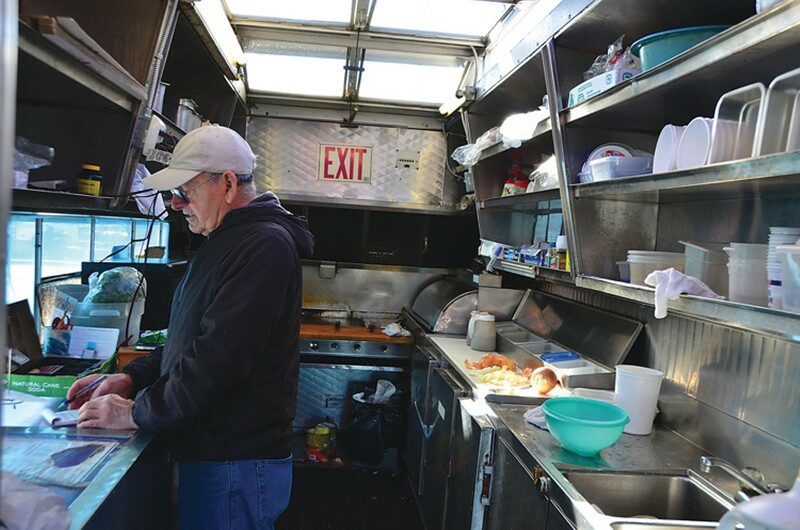 In late February, Jose Magaña was running the Que Grande truck at its usual spot, outside the Ace Hardware in McKinleyville, while his son was getting treatment in LA. The elder Magaña was still thinking about that doorstep encounter, when Dickinson announced he’d soon own their home. “I can buy it, easy,” Jose remembers Dickinson saying. Easy.